A US man held for drug possession has escaped from Bali's most notorious prison and is on the run on the Indonesian resort island. Local media named the fugitive as Chrishan Beasley, arrested in August for carrying 5g (0.18oz) of hashish. The 32-year old made his escape by scaling a prison wall with a fellow inmate who was recaptured immediately. The maximum sentence for drug trafficking is death. Beasley and the other inmate reportedly escaped by climbing over the prison wall with a ladder from a construction project within the prison. Other reports suggested the two had cut a hole in the roof with a hacksaw first. The US citizen was still awaiting sentencing and it is not clear how much jail time he was likely to get. The other prisoner, also from the US, has been named by media as 57-year-old Paul Anthony Hoffman who was serving a 20-month sentence for armed robbery. Hoffman was caught immediately after making the escape while Beasley managed to get away. In June, there was another jailbreak at Kerobokan, when four inmates escaped through a tunnel they dug under a wall. 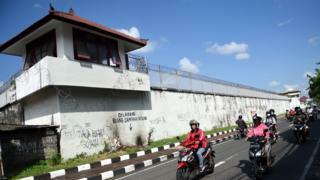 Kerobokan prison is also where some of the so-called Bali Nine are held, a group of Australians convicted of drug-smuggling. Despite protest from Australian authorities, two of the group were executed in 2015, while the others are being held in prisons across Indonesia.